Gliding steadily across borders from France to Luxembourg into Germany where it takes a meandering course and eases the valley into an luxurious pace of life is the Mosel. The Mosel river or Moselle (depending on the language of the country it runs through ) transfuses through the valley a sense of calm and tranquility unlike its comparably riveting elder sister Rhine. The Mosel best known for its wines has its past aged in roman history and boasts of the oldest town in Germany. Late summer, I took a short but memorable road trip along the length of the meandering Mosel, visited wineries and vineyards while sipping some wein (wine in German) and collecting some for my cellar. Being the third largest wine-producing region in Germany and the producer of the finest Riesling in the world, the Mosel valley is surprisingly understated even today and its less likely that the uninitiated wine lover would differentiate its wines from any of German wines. However Mosel Riesling are distinct in their taste and composition from that of the neighboring Alsace and Rhine valley as I have mentioned on the blog – European Wine Trails To Visit in 2019. On my journey, I discovered that the valley has more than barrels of matured wines, it has a generous sprinkle of castles and villages that command your attention. It has two tributaries Saar and Ruwer and the valleys of these tributaries are a part of the Mosel wine region. Together with the Rhine river they form the Rheinland-Palatinate or simply Rheinland-Pfalz wine region of Germany. Imagine the Mosel as a fine necklace of enchanting and mesmerizing half-timbered villages stringed one after the other until you meet the confluence of Mosel and Rhine at Koblenz. In this post I am revisiting the villages and towns on the Mosel and share the reasons why you need to stopover for a lunch, evening supper or a night over and proceed towards Koblenz. Lets get on this inspiring journey on the Mosel. I arrived from Strasbourg, Alsace to Trier, Germany the capital city of the valley and the oldest city in Germany. Trier is a bag of delight for one and all, its heavily cosmopolitan and bursting with youth thanks to its wine institutes and university. Its past is embedded in the Roman era and the art of wine making was introduced to the city by the Romans who ruled over it for centuries. I checked into the Becker’s Wine Estate and Hotel, a fine hotel with modern design and functionality under the cloak of a charming half-timbered wine estate building. 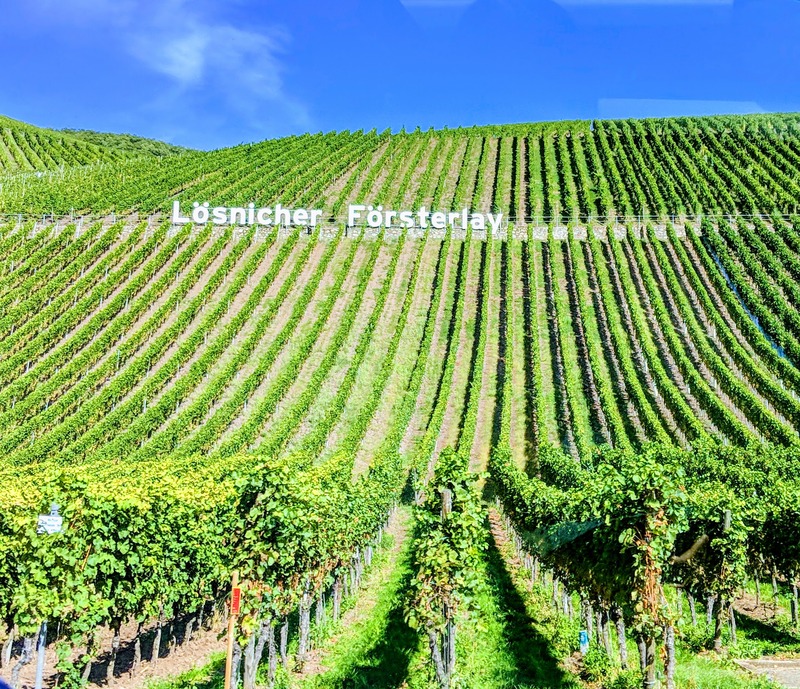 Early morning after breakfast I set off on a road trip to visit the city of Trier before my visit to Bishoflische Weinguter Trier – an old wine estate with a winery that goes back and underground a few centuries. Trier was first conquered and settled by the Celtic tribe Treveri and hence the name is a derivative of the tribe. Since the 17 BC, Trier has enjoyed uninterrupted urban civilization and still going strong in its 2035th year of being a city. Emperor Constantine to Emperor Augustus and later the French have had a significant influence on Trier’s history. While being out and about in the city I came across ancient Roman ruins like fortification around the city, gates, baths, buildings and forts. Porta Nigra is one of the best Roman ruins to visit while in Trier for its design and structure being so vast no wonder it stood unchallenged as the fortified gate. Before the winery tour and wine tasting in Trier I walked into the city center and observed the pastel painted buildings lined up by the streets while cafes were busy pouring espresso and coffee with breakfast to its patrons. The city was only opening its shutters to welcome travellers and resident shoppers to its boutiques, artisanal stores and cafes. As mentioned earlier Mosel has a string of towns and villages and covering them all will be a lengthy task not to mention a snooze fest with that much text being thrown your way. So I will cover just the towns and villages you shouldn’t skip visiting if you plan a summer vacation to the wine region of Mosel. Mosel is the most wonderfully meandering river I have ever seen and the best part of its course is the hairpin loop it takes and goes around a piece of land or so it appears from the opposite side and repeats it alternatively forming bends that make it seem like a serpent has moved through the valley. One of the best spots to capture its loops and bends from atop the hills is at the towns Lewein – Trittenheim. This is where you too can capture a great view of the river almost encircling the land and turning around to form a loop with the vines on its steep terraces glance the glistening water. You can bike your way through the vineyards or go hiking from village to village taking in the verdant panoramic views. Wineries: Weingut Georghof Thomas Schmitt, Die Rieslingwinzer – Weingut Spieles-Fuchs, Weingut Grans-Fassian, Weingut Loersch. The Gingerbread or Half Timbered Town is like being inside a page from your childhood fairy tales. It’s no wonder most of our fairy tales have been inspired or written in Germany with villages and towns looking every inch adorable and charming like Bernkastel-Kues. The Mosel was my constant companion all through our journey from Trier to Lewein to Bernakastel and it was quite a reticent yet affable company to have while my eyes goggled upwards to the vineyards that were almost upright in their elevation on the hills. While I was on a road trip in a car, there were many who were biking their way through the route and some into the vineyard paths, I quickly made a note of biking along the river on my next visit (Oh yes, Mosel region has become my new happy place dethroning Bath and Windsor). Bernkastel is effortlessly a happy spot to saunter through the narrow lanes with tilted half-timbered houses, wine stores with rows and rows of the region’s best wines and probably some of the best in the world. I brought back some known Rieslings, one of them had their vineyard and winery just behind the town center perched on a hill. The town center of Bernkastel can set any social media savvy traveler into a frenzy of capturing the best shot of the houses so adorable and picture perfect – a true #nofilter town. Wineries: Weingut Dr H Thanisch, Weingut Markus Mollitor, Weingut Kiesch Bernkastel-Kues, Weingut Dr Loosen, Rieslingweingut Erben Karl Dillinger. Avid photographers and drone video lovers here is the town you would want to pit stop for that perfect aerial shot of the Mosel’s almost circle forming loop at Traben Trarbach. It is the hero shot for your Instagram to grab some frenzy wanderlusters double tapping your image and wanting to know where on earth is this piece of heavenly land. If you are winding down the Mosel river,, stopover on the Trarbach bank of the river, this town is where you need to have a picnic lunch with of course wine from Traben Trarbach or Barnkastel, do some gram grabs and drone captures and off you move on to the next town on the Mosel. Wineries: Weingut Friedrich Storck, Weingut Weiser-Künstler. Ever shopped for a wine from a garage? Well there is always a first for everything including buying wine from someone’s garage. I honestly couldn’t do this myself since we were short on time but I did see a few buildings with garages at the bottom with wine making set up and a table laid out for wine tasting and shopping bottles. Some of them even set up a small table and chair across the street by the river for their customers. Its something I have never seen before among wine-makers and on my next visit it is the one experience I will complete before I get home. Zell is also known for its legendary Black Cat of Zell and the wine it loves. Zell is a sleepy quiet town and to miss it would be as much a shame especially its garage wineries. Wineries: Weingut Treis, Ferienweingut Hallenbach (Garage winery and wine shop), Weingut FJ Weis, Weingut Lindenhof. Before you reach Koblenz there is one last and significant town worth visiting along the Mosel – Cochem. Cochem has this poster- village scenery to represent the entire valley complete with its castle atop a high mountain skirted by forest and then some lace of vineyards running towards the river from the hills. 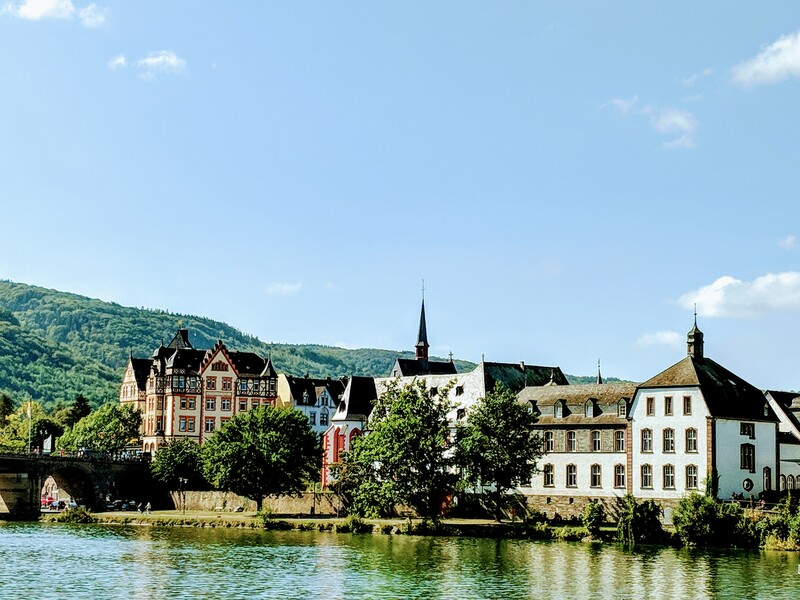 Cochem also is a laid back B&B town where travelers can relax and let their travel take a peaceful pause to enjoy a glass of the finest Rieslings the town produces. My last stop before I took a break in Koblenz was here in Cochem albeit it was the shortest stop. If you have time to spare and spend the night Cochem is a wonderful town to explore especially the castle and its wineries. Journeying to Koblenz from Cochem was again surrounded by vineyards and river by my side and once I reached Koblenz that good cosy feeling of being in fairytale world of Germany seemed to be washing out as a big city was welcoming me. Little did I know the most romantic part of my journey into the wine region of Germany was just peaking.